The German Plum Dumplings is a sweet dish called "Zwetschgenknoedel" in German and if you had been living in Germany you might know this delicious dish. You enjoy them warm, with melted butter and sprinkle a cinnamon-sugar mix on top. 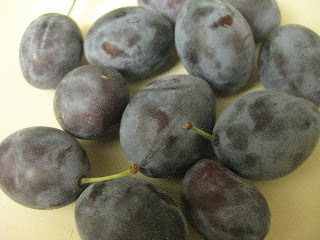 Regarding the plums that you should use, you would use Italian or Filbert plums which we call "Zwetschgen" in German. They are smaller and more oval than round. 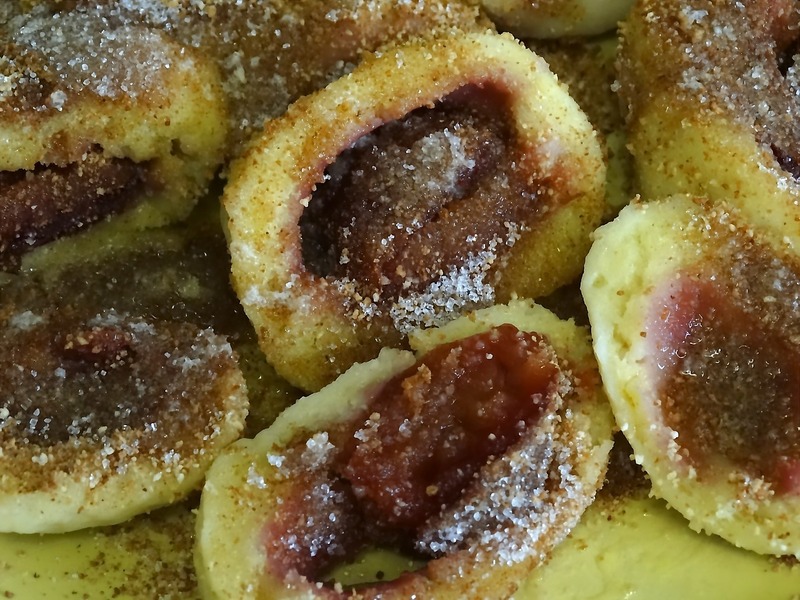 As far as we know the plum dumplings are actually from Austria (the Austrian recipe contains potatoes), and is a typical "sweet Mehlspeise" - translated it means a sweet dish containing flour. Austria is famous for its sweet "Mehlspeisen", they serve them as an alternative for a supper. Happy Cooking! - Make a dough out of quark, butter, egg, flour, hint of salt and sugar - use the mixer with kneading hooks - the dough should not be liquid, you need to be able to form dumplings out of it. - Wash plums, dry them, and cut each one in half, but not completely, remove the pits. - In a big pot bring enough water with 1/2 tsp salt to a boil, then add the dumplings, one after the other. - Let them cook on low heat for up to 15 minutes, leave the lid a bit open. - Meanwhile melt some butter and prepare the cinnamon-sugar mix in a bowl. - Take dumplings out with a slotted spoon, and serve them right away. - Pour melted butter over them and sprinkle with the cinnamon-sugar mix. You also can use prunes from the jar; the juice can be heated up and served with the dumplings. The dough should not be sticky; put some drops of cooking oil on your hands, if the dough is a bit sticky. Try it out with Vanilla sauce. Some say quark that is available in the USA might not be as good as German quark, some say it is just fine. I found quark in the California supermarket chain and organic store Wholefoods. I wouldn’t. Some make a mix with cream cheese and sour cream like in the cheese cake recipe: 1 pound low fat quark – you also can use instead 2 cups cream cheese Neufchatel 8oz and 1 cup light sour cream. Or make quark, it is not so difficult.